Safety Squat Bar 2.0 – 700lb Capacity – By B.o.S. Home/Specialty Barbells, Equipment for Crossfit, Powerlifting/Safety Squat Bar 2.0 – 700lb Capacity – By B.o.S. The Safety Squat Bar has been used very successfully over the past ten years for training athletes with limited shoulder, wrist and elbow mobility as well as improving your posterior chain. First, this bar look beautiful. Really polished finished product. Having now owned both this version and version 1 (which I sold when I moved, I liked the previous one better. I’m not sure if the designed changed but the handles of this version feel farther apart (mine measures 13-3/4”) than version 1. The handles sit right on the top of my shoulders and it’s honestly really uncomfortable. I did not have any similar issues with the previous SSB. Perhaps BOS will consider revising in future models. Safety Squat Bar 2.0 - 700lb Capacity - By B.o.S. Hey Jason, thanks for the review and the feedback! We appreciate it and I can pass this information onto the team to improve our products for the future! item was on back order for a few months however, it was well worth the wait. When the bar arrived at my home, the box was pretty much destroyed, and taped up to hold it together. The bar was wrapped in plastic however, there was some chips, scratches and minor rust spots on the end caps. Nothing major, just cosmetic. The bar itself is very well built in my opinion. The coating on the barbell appears to be of good quality. The pads are very nice, they are vinyl, which is what I was looking for instead of the usual nylon. The only down side of the pads, is they move around so, I put carpet tape in the inside, which solved the problem. I’ve used the Rogue SSB before numerous times and this one is way more comfortable and I prefer the handles on the bell of steel bars. The bar sits perfectly on my rogue ML390. As the Elite Fts yolk bar is far too expensive, and the shipping is the same price as the bar, this to me was a perfect alternative and a great price. Would highly recommend. As per my usual experience with this company, great costumer service !! Hey Nicolas, thanks for the great review! We apologize for the issues in the shipping but are happy the bar is still in good working condition for you to use! Offering a quality bar for a great price is what we love to do! Thanks again for the review! I waited a long time for this bar to come back in stock and man its amazing and you cannot beat the price for quality. I was contemplating getting the rogue saftey squat bar but didn't due the excessive price and I would rather support a local fitness brand. It is an Amazing Bar and would definatly recommend it. However the neck area is a little to small for me but it works, may be a problem for bigger guys though. Shane, thank you for the review! Being able to offer a good quality bar for an even better price is what we love to do! Enjoy, and happy lifting! Love it.Given my issues with shoulder rotation this has once again allowed me to do back squats in comfort. Hey Brian, thanks for the review! It is awesome to hear you are back squatting comfortably again! Happy lifting! Safety Squat Bar 2.0 model comes with a beefy 700lb weight capacity, striking rust-resistant black zinc finish with bright zinc sleeves and weighs in at a cool 21.15kg. So you’ve been smashing your squats, hitting PRs and making those gains you’ve been chasing – but, some days getting under that stiff bar is tight and bugging your elbows. Or maybe you’ve noticed some issues with your squat form falling forward too much and you’d like to improve. Or perhaps you are suffering from a shoulder injury and still want to be able to squat. Then the Safety Squat Bar is a fantastic option for you. The Safety Squat Bar is the perfect accessory or supplemental movement for the barbell squat. There is a reason The Safety Squat Bar is a staple for the likes of Brian Shaw Louie Simmons and many more. 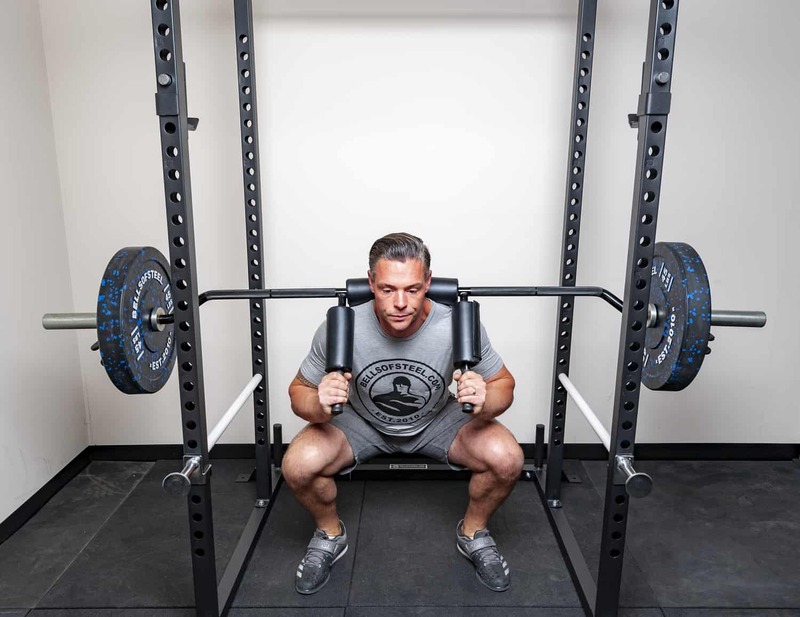 Because of the neck pads and handles on the front of the bar, you’re able to squat without having the weight of the bar dig into your wrists and elbows, nor will you require the shoulder mobility to keep your hands on a regular straight bar. If your squat is a bit too bent over the Safety Squat Bar is foreign enough of a movement to build up areas where the barbell squat might not train while staying in the same movement pattern. The sleeves are made at an angle so the weights will be more in front of you, training you to stay more upright, and tight. The Safety Squat Bar has been strategically designed to strengthen your posterior chain due to the weights being in their unique position and will develop your glutes and lower back that will help improve your deadlift as well as your squat. And let’s be honest, this bar looks awesome! So not only will you give those wrists and elbows a break and build great strength in your posterior chain, you’ll look super cool while doing it.